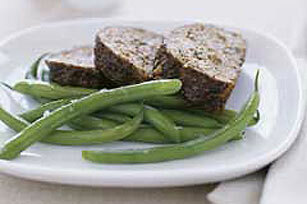 Bake this Miniature Meatloaf Recipe into four oval loaves on a foil-covered baking sheet. This gravy-and-stuffing-based Miniature Meatloaf Recipe is unfailingly moist and flavorful. Preheat oven to 400°F. Mix water and gravy in large bowl. Add meat, stuffing mix and eggs; mix lightly. Shape into four oval loaves on foil-covered baking sheet. Bake 30 min. or until cooked through (160ºF). Slice and serve with your favorite vegetables. Enjoy these meatloaves with a serving of potatoes and a steamed colorful vegetable, such as carrots, broccoli or green beans. Plan ahead! Prepare meat mixture as directed. Divide in half; shape half of the mixture into two oval loaves on foil-covered baking sheet. Shape remaining meat mixture into 16 meatballs, each about 1 inch in diameter. Place, in single layer, on another foil-covered baking sheet. Bake meatballs and meatloaves at 400ºF for 20 min. Remove meatballs from oven. Bake meatloaves an additional 10 min. Serve meatloaves tonight. Refrigerate meatballs overnight. The next day, mix 1-1/4 cups beef gravy and 1/2 cup BREAKSTONE'S or KNUDSEN Sour Cream in large saucepan. Add meatballs; cook on low heat 10 min. or until meatballs are heated through, stirring occasionally. Serve with hot cooked noodles and a green salad. Makes 8 servings total (4 servings of meatloaf, one-half meatloaf each, and 4 servings of meatballs, four meatballs each). This recipe gives you a different food idea for tomorrow night. One serving of the Swedish Meatballs provides 390 calories, 22g total fat, 10g saturated fat, 145mg cholesterol, 840mg sodium, 21g carbohydrate, less than 1g dietary fiber, 4g sugars, 28g protein, 10%DV vitamin A, 0%DV vitamin C, 8%DV calcium and 20%DV iron. Kids can help cook by mixing the ingredients and shaping the meat mixture. Makes 8 servings, one-half meatloaf each.